Smiles are not universally valued among people around the world, but even cultures that don’t smile as much as your average American understand that a smile isn’t a sign of aggression or anger. Even a beaming smile may seem slightly suspect, it’s a consistent enough expression that animals have even learned how to read human faces. The assumption was that a dog or horse’s ability to differentiate between smiling and scowling humans was the result of generations of selective breeding- humans would favor the animals that could best adapt to our interests, leading us to promote those abilities in domesticated species’ gene pools. 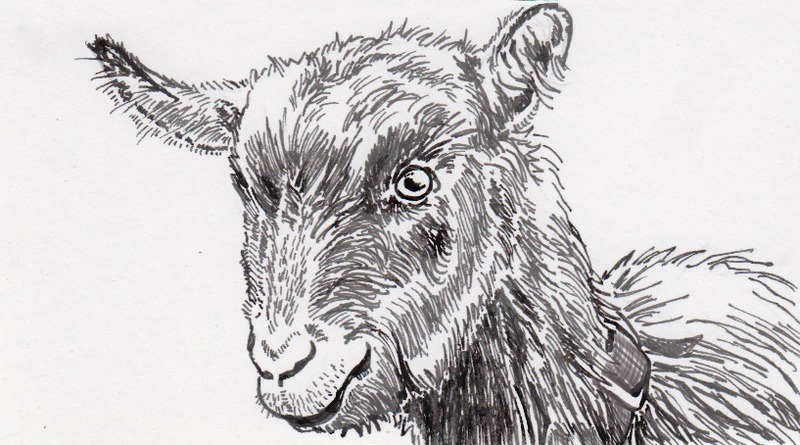 However, a recent study with goats has complicated matters, as our cloven-hooved companions were found to also discriminate between happy and angry faces, even though humanity as only been influencing goat genomes for a relatively short time. Goats at the Buttercups Sanctuary for Goats were shown photos of unfamiliar humans taped up to a wall. Each pair of photos showed the same close-up of a person’s face either smiling or scowling. Not only did the goats show an interest in the grayscale print-outs, but they also spent the majority of their time gazing at the smiling face instead of the angry one. Hinting at the neurological processing behind this decision, the goats were especially drawn to the smiling faces when they were more easily visible to the goat’s right eye. While the goats didn’t have an EEG cap to monitor brain activity directly, this preference suggests that the positive emotions were primarily processed in the goats’ left brain hemisphere. The most significant aspect of these finding may be that they were somewhat of a surprise. People who work around goats have likely learned their personalities and behavior, but there was still an assumption that only heavily-bred animals like dogs and horses could read a human face so well. By demonstrating that goats are sensitive to this kind of human expression, it raises the possibility that other livestock is as well. This may require changes to how guidelines about working with animals, as humans may inadvertently be communicating with animals more than we’ve realized. This does not mean that a western-style grin is completely understood across all animals on earth though. Humans may have convinced dogs and goats to look forward to a big smile, but chimpanzees and other primates don’t quite see our smiles as something pleasant. Chimps do have a friendly smile, but they take care to keep their upper teeth covered when doing so. Instead of being perceived as attractive or friendly, exposed upper teeth are seen as a threat, so save your bigger smiles for the species who have had a little more practice living around humans.